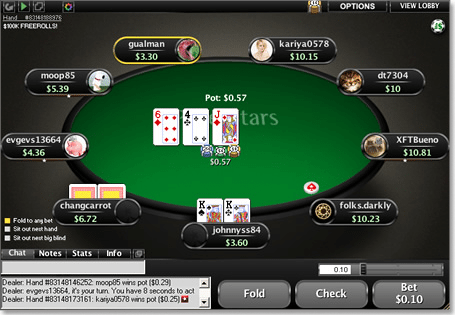 Online poker Sit-N-Go poker tournaments can be a good starting point for budding poker players. Websites like 888 Poker, PokerStars and Full Tilt Poker all have plenty of Sit-N-Go tournaments. These types of tournaments have a player cap on them and when you hit the limit the game starts. This page is intended for international readers only, due to online gambling being illegal in Australia as of September 2017. What Are Sit and Go’s? Poker tournaments will either be scheduled or sit-n-go tournaments. Scheduled tournaments begin at a predetermined and usually you must register a certain amount of time before the tournament begins. Often in scheduled tournaments any number of players can partake as long as they have signed up to it in time. On the other hand sit-n-go tournaments will begin as soon as enough players have signed up to participate in it. This means sit-n-go tournaments are defined by how competing players there are. If you’re playing at a popular poker site then the waiting time to begin a tournament will also be much shorter as you only have to wait for enough people to sign up. Are Sit-n-Go Poker Tournaments good value? Sit-n-go tournaments are good value for money in that the number of competing players is capped. This means you won’t be stuck playing for hours against a huge number of other people. In general sit-n-go tournaments are wrapped up faster. Having said that some sit-n-go tournaments commence when there are as many as 1000 players, so even though how many competitors in a tournament may be capped that doesn’t mean there are only a few of them. You’ll have to check out the individual rules and guidelines of the particular sit-n-go tournament you wish to play if you’re concerned with how many players you’ve got to compete against. However as a general rule sit-n-go tournaments are almost always played out faster than scheduled tournaments, and usually have lower entry costs as well. Normally you begin a sit-n-go tournament with fewer chips and the bet blinds are raised earlier on. Another rule is that you often cannot buy back into a sit-n-go tournament once you’ve been eliminated, again this helps quicken the pace of the tournament as a whole. The only drawback of sit-n-go tournaments is the prize pool is a lot smaller than what you would get at a larger scheduled multiplayer tournament. Where can you play the best online sit-n-go tournaments? For poker tournaments you’re best off playing at a dedicated poker site rather than more general online casinos, as virtual casinos will often have video poker games but not necessarily any live tournaments. 888 Poker hosts sit-n-go tournaments with as few as 2 and up to 360 players, however most of its sit-n-go tournaments only need six or nine players to get started. Once there are the required number of players no one else can enter the tournament at a later stage (at 888 Poker you can buy back into a tournament for the majority of its multiplayer tournaments). Its types of sit-n-go tournaments include; Turbo Speed, Super Turbo, Bounty, Knockout and Double or Nothing. This is one of the biggest poker sites and it has a diverse selection of different tournament types. Its sit-n-go style tournaments include; Spin & Go (this tournament only requires three players to get started and you could potentially win a huge amount if you’re the top player, it has a very low entry cost but you don’t know how much is in the prize pool until the game begins), Fifty50 (this is a 10 player sit-n-go tournament that ends when five players are eliminated which means that half the players who enter leave with a payout), Steps (this is a progressive tournament where you work your way up a ladder to be eligible for bigger prize pools), Knockout (where a bounty is placed on every entrant and each time you knock someone out you get a bonus prize), 6-Max Sit-N-Go and 4-Max Sit-N-Go. Full Tilt is a poker site that specialises in sit-n-go games of poker, most of its tournaments are sit-n-go variants with a few exceptions. Full Tilt has; Super Turbo (where you start with a shorter stack and blind levels escalate more quickly), Deep Stack Tournaments (where you begin with 5000 chips), Knockout Bounty, On Demand Tournaments (sit-n-go tournaments where you can register and join the game later for a cost), New to The Game Tournaments (where only new players are given access), Jackpot Sit-N-Go Tournaments (here you can win a prize that is worth 2000 times the cost of the buy in, all you need to do is select your preferred stake level and you’ll automatically be matched up with two opponents). If you are familiar with making real money deposits at online casinos, the payment process at dedicated poker sites is similar. If you’re new to playing real money casino or poker games then don’t worry, it’s very easy and quick to do. First you’ll need to sign up to your casino account so that you’ll have access to the same funds whenever you decide to play. Next, head to the ‘Banking’ or ‘Real Money Play’ section of your preferred poker site. At the poker sites we recommended above you will be able to make real money deposits and withdrawals using the following payment methods; Visa credit and debit cards, MasterCard credit and debit cards, Maestro debit cards, Neteller, Ukash, Skrill Moneybookers, POLi, PaySafe card, Local Bank Transfer, EntroPay, Pay Pal and a few others. You can also have your withdraw your winnings by having a cheque delivered to you in the mail however you cannot make a cheque deposit. All of these poker providers utilise 128-bit Secure Socket Layer digital encryption technology, which is the same technology that many major banks use, to safeguard your financial details and protect your money from any outside parties. Although there are some free poker tournaments you’ll need to pay an entry fee for the most part in order to be eligible for real money prizes.